Meal delivery services are nothing new, but they are becoming more and more popular by the day. People are starting to realize that they don’t have the time to prepare healthy foods and that eating junk food and fast food only deteriorates their health. Healthy meal delivery services made their way on the market a couple of decades back. Today we have more and more companies popping up all over the States as the demand for healthy meals sore. There are many different companies to choose from, so finding the one that fits your needs best can be a drag. You’ll have to compare their prices, menus, food preparation, deliveries, and much more to figure out which of these services you need. So, in order to help you out making that choice, we’ve done a complete comparison of two prevalent services: Sun Basket and Green Chef. Let’s take a closer look at what these two services have to offer. Are there any lunch plans? Do they offer meals for one person only? Can I get these services as a gift? Both of these services have a great offer and a long tradition. They are well-trusted among their clients, but what do they offer? What is their primary goal? 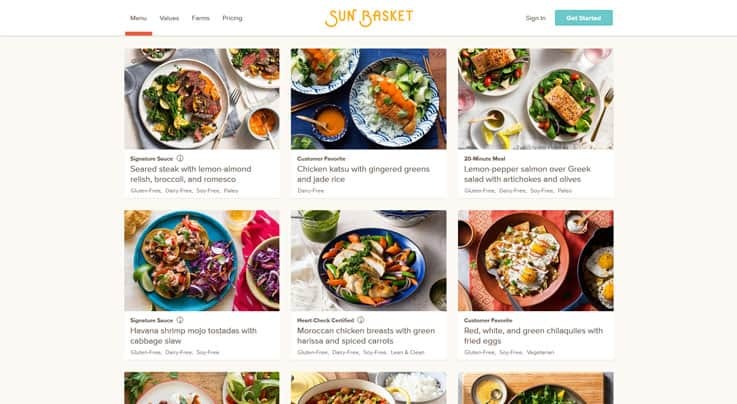 Sun Basket is a meal delivery service that offers only organic and non-GMO ingredients. That is the most important goal of the owners of the company, and they follow it flawlessly. All of the ingredients are fresh and of the best quality and is prepared by top chefs. The food is prepared following the highest of standards and it’s delivered to your home once a week. They offer a gluten-free diet, as well as a family pack, paleo, and vegan options. For more information about them, you can check out our sun basket review here and see what meal plan suit your needs. As you can probably guess from the name, Green Chef is focused on eating and living one with nature. They are very passionate about food growing and preparation. All of their ingredients come from farmers who grow only non-GMO ingredients. In fact, they claim that they use the most organic ingredients of all meal delivery services right now. You will find healthy veggies in every dinner. In order to make your choice, you have to know all of the features you can expect from both services. We’re going to take a close look at their options and compare each one. Both of these companies offer their clients the options to customize their menus. You can customize each week with Sun Basket, and Green Chef provides the same options, with the add-on of some individual meal plans for you to choose from. Some people like to taste the food before they make a decision. With Sun Basket, there are no free trials, and you’ll have to trust us that their food is delicious and healthy. On the other hand, Green Chef does offer a free trial, but you have to leave your credit card information first. It is a definite plus if you want to make sure that the food you’re getting fits your taste. Lunch plans are not included in either of these services as they are destined for people who work 9-5 jobs. No, both of the services offer their meals for at least two people. They also have particular family offers designed to keep your entire family fed and healthy. Gift certificates are a neat idea. Green Chef doesn’t offer any, but Sun Basket leaves you the option to surprise someone with a healthy meal plan without their knowledge. Many food items on the menus of these services are too much for some clients, which is why we took a closer look at what type of diets they offer. Both services have Gluten Free, Paleo, Traditional, and Vegetarian menus in their offers​. The price of the services is one of the most important features you should check before subscribing. Even so, know that cheaper is not always worst. With that in mind, let’s take a look at the prices. The average serving price for Sun Basket is 10.63 dollars, and the average price for Green Chef is 13.99 dollars. The price for two servings in a classic menu at Sun Basket costs about $70 for 3 meals a week. The other company has a bit more to offer because they have a number of different menus. Their price for 2 servings a week is between 72 and 100 bucks, depending on the type of diet you chose. The paleo diet is most expensive. Now, if you want to get the package for your entire family, the prices are a bit different. Sun basket lets you choose the number of meals you wish to receive each week. They offer from two to four meals with four servings. Depending on what you want, the price varies between 80 and 160 dollars a week. With the other company, things are a little different. They only offer 2 meals a week for a family of four and depending on the menu (is it omnivore or carnivore) you will have to spend between 105 and 113 dollars. That’s much cheaper than the competitor, but you also get far less food. Customer service is super important when you want to gain more customers. It’s the first thing you’ll encounter if you decide on ordering a meal plan, so naturally, we had to test how they work and what our options are. The customer service for Sun Basket is available Monday to Friday from 8 AM until 9 PM. On Saturdays and Sundays, you can reach them between 11 AM and 7 PM. Green Chef’s customer service is available only on workdays between 7 AM and 5 PM. You can contact both companies at any time through their e-mails. If you decide to switch your meal plan on the go, you should know what your options are first. Sun Basket is super-flexible, and they allow you to switch plans on the go. One call is all you need to switch from the Classic to the Family meal plan. You can also change the dietary options at any time. The only thing you can’t do is mix recipes from different meal plans. On the other hand, Green Chef gives you all the options you need. You can change your meal plan at any time, and you can ask them to deliver the food on a two or four-week basis. To cancel your order with Sun Basket, you just need to call them. You can also skip a week at any time. If you decide to cancel, you will have to wait for the cutoff time. If you cancel the delivery after the cutoff time, you will still receive your meal for the week. 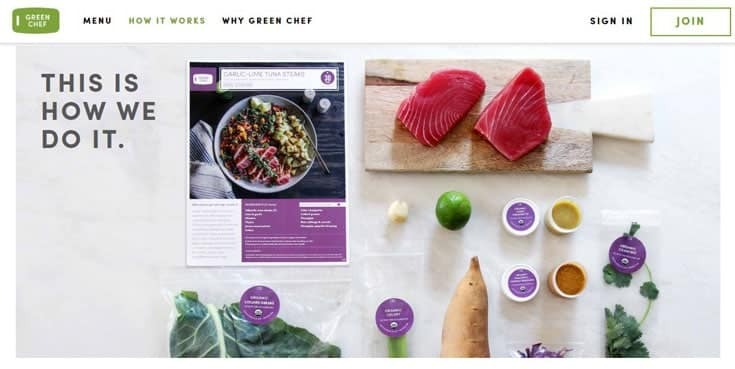 Green Chef allows you to skip an order or cancel the delivery at any given time. You will still have to wait for the cutoff time for the meals to stop arriving. It is evident that both of these services are professional and well-trusted. However, there are some differences between them. Sun Basket keeps their focus on the taste of the food and professional delivery. They offer healthy organic meals with all of the proteins, carbs, and vitamins you need. You can choose from a couple of menu types, but you’ll always get tasty, healthy food, no matter what. Green Chef is, as you can imagine, green. They have a USDA certificate for organic food and meal delivery. All of the food comes from sustainable organic food producers, and professional chefs prepare it. All in all, the best way to figure out which of these services is best is to try them both out. Compare the prices, compare the menus and the tastes. Be sure of one thing – no matter which of these services you choose, you’ll eat much healthier and probably even lose some weight in the process. Hello, welcome to Meal Delivery Experts! We’re bringing to you the most important details about different meal delivery services and help users make the right choice when choosing the best company for their needs. Our team of advisers and researchers have familiarized themselves with every cranny and nook of this industry. And our guides, reviews, list, and charts will help you make an informed decision. If you are looking to save some money on your meal delivery subscription, don’t forget to use our coupons to get discounts. Here you can find the latest coupons, codes, and deals, and save up to 50% on your food.